In today’s demanding printing environment, a flexible solution to booklet production is a must for all digital printers. Often there is a need to merge jobs from more than one digital print device or to add colour, laminated or coated covers to finish a booklet. There may also be a requirement to finish booklets from several digital devices, where an inline solution on each machine may not be a cost effective solution. 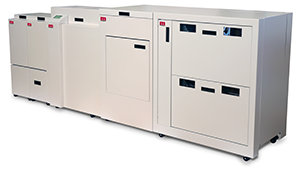 The System AF2000S with its high capacity dual bin feeder offers a flexible solution for a wide range of booklet types and sizes. The system is fed by the AF602 air assisted feeder which has a loading capacity of up to 21″, giving long uninterrupted production runs. The bookletmaking section can be supplied with heavy duty stitching heads for up to 50,000 stitches from one wire spool, or with stapling heads which can be loaded with 5000 staple cassettes. A fore-edge trimmer comes as standard to give clean finish to the booklets.